I'ts Monday! And what better way to start a Monday than playing with some Combaticons! 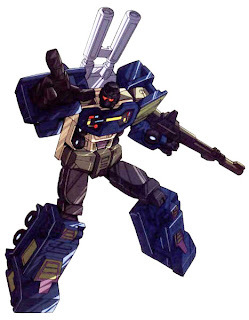 Today we are going to take a look at the bot that runs the show... the Combaticon's leader, Onslaught! Onslaught is the brains behind the Combaticons; he calls the shots and the others listen. But, when things need to get cranked up a notch, Onslaught can combine with the rest of the Combaticons to form the massive Bruticus. Onslaught is labeled 1 of 5 in our Bruticus line-up, but since I'm working my way up the combiner, he's next in line. Does Onslaught fit into your plan to own, or does it all go wrong? Take a look after the jump! Seemingly no matter what universe Onslaught comes from, he's a tactician. He plans and plots battle plan after battle plan trying to devise the best method to exterminate Autobots and take objectives. Onslaught LOVES to plan. Most of his battle plans don't include him directly, but make no mistake, Onslaught can brawl with the best of them; he's powerful and has the firepower to stop most of the largest Aubots in their tracks. Onslaught comes packed in the new standard red card for the Generations line. Like Swindle and Brawl, there is some really nice art work depicting Onslaught himself. The card insert gives us a glance of Onslaught's Fall of Cybertron Alt-mode. Once again "BUILD GIANT ROBOT!" makes an appearance on the front. The card back gives us the standard Bio, Tech-Spec read-out, shots of Onslaught in bot Bot and "Cybertronian Missile Carrier" Alt-mode. And of course, we see that Onslaught is shown as the main body of "Decpeticon Bruticus"
Once again I am confronted with a really light bot. From the front, Onslaught looks good. From the sides... he's ok... from the back, he's kinda hollow with the back of Bruticus's head completely visible. Onslaught comes with one accessory, his "gun". It's a really awkward gun. If it collapsed down or came in two pieces, I'd be happier with it. It's just a weird size for his Bot-mode. Getting Onslaught into Alt-mode took a little more effort. I actually had to look in the instructions for a few things. From Bot-mode, fold his legs outward and in at the knees. Rotate his shoulders to show the Alt-mode fenders and turn him around. On Onslaught's lower back is a winged piece that is the combined mode's waist shield basically; Bruticus' cod piece. This is set on 2 hinges, fold it out. The base hinges folds down under the post it is connected to. The two posts on the back of Onslaught's upper thighs will fit into two raised holes on the waist shield. Swing Onslaughts upper body back. His arms then fold in and rotate back to form the roof of his Alt-mode. Onslaught's gun then fits onto the posts on his forearms. I'm not sure if I did something incorrectly as the gun points downward. The pics I look at showing in sitting fairly horizontal... I can't see where I went wrong. But since he'll be formed into Bruticus for his display life... it doesn't bother me. It's not a bad Alt-mode. Though, it doesn't really look like his CG model. The model is much bigger and bulkier while this looks like it wants to have a truck bed. It reminds me of G1 Kup... a super-deformed G1 Kup... shorter and fatter. Getting Onslaught to Torso mode is best started from his Bot-mode. Like you're converting him to Alt-mode, start by folding his legs out at the knee and in. Where Onslaught's knees were are now the connectors for Bruticus' legs. Turn Onslaught around and hinge the black shield all the way down. Instead of folding the arm it's mounted on under itself, leave it out and fold the shield back up at it's base hinge to form Bruticus' waist shield/cod-piece. Rotate Onslaught's upper body 180 degrees. Flip Onslaught's arms out at the shoulder and then fold them forward. There are two posts of the vehicle fenders that the hands can grasp. Fold Onslaught's head down and Bruticus' head pops up since they're on the same plate and spin Bruticus' head around. Onslaught's gun fits onto Bruticus' back using two posts and two tabs. The underside of the guns just pegs right on. Despite the Generations figures being larger on their own, their combined form stands barely taller than my FansProject upgraded Bruticus. With the FP Bruticus fully formed, back cannons and all, he is taller (we'll see those pics later). There isn't too big of a size difference between Onslaught and Onslaught. The Generations mold is roughly the same size; probably because the Energon mold is made to be a torso, he's bigger than his appendage brethren. All in all, I'm still happy with this set thus far. Onslaught looks good, though his colors still place him into the Fruit-Strip Combaticons category. While the SDCC Bruticus is colored in a way that I'd prefer, I can't bring myself to open him so the mass retail releases will have to do for display purposes. We've got two more figures to go and so far he's shaping up just fine. Bruticus looks like he will be pretty well sized and tower over the Classics figures as he should. In all honesty, I'm still happier with my FansProject upgraded Bruticus, but it's certainly nice to see Hasbro putting out an honest to god real combiner. And they're certainly getting their use out of the molds as I wrote about HERE. Pics, review, and battle plans by Scion of Primus. Onslaught is my absolute favorite. He always has been. Keep an eye out on my site today, I'll post on mine because I did a few things that help, and I did notice yours is a bit off in Truck mode, the gun should be mostly level. It takes some dinking around with the arms though. I fully agree about the gun. I don't like it. Plus, they're technically his cannons, so it should mount on his back so he has the two barrels sticking up, and then come with a better rifle. Those issues aside, I love him. He's my "Desk Guardian" seems my SDCC version stays on the shelf. I can't wait for Impactor! @Pax... I love your use of Rumbles cannons! Nice! Yeah, I like how they end up working really well with him. For the time being, until hopefully someone makes some kind of upgrade kit!